It's the first Friday of the month, so that means it's time for Friday Night Movie Reviews once again! Join us under the cut to see what we've been checking out this month. For me the DC animated movies have been hit and miss. They can look a little cheap and they tend to drag. So I was preemptively cynical about DC’s capacity to adapt Frank Miller’s crazy, balls-to-the-wall, Old Man Batman classic, The Dark Knight Returns - one of the greatest comic series ever feverishly poured on the page. Turns out I need to have some faith, loosen up, and quit being a jerk. Split into two parts (and adding up to an epic two and a half hours overall) this is a surprisingly faithful adaptation which certainly captures the spirit of Miller’s original work, hitting all the key moments but also impacting on the audience in different ways to the book. Of particular note are the large fight scenes which come to visceral life on the screen, often feeling far more vivid in motion than their static predecessors. In fact I’d say that the movie handles the up-close-and-personal stuff very well, especially when its laser focused on Batman’s arc. I’d argue that it’s really just the larger scale, crowd sequences that the film is unable to handle quite as well, the limitations of the animation sometimes holding it back. Peter “Robocop” Weller steadily won me over as the older Batman and the supporting cast is strong, especially Ariel Winter as the new teenage girl Robin. But best of all this film reminds of just how brilliant and inventive Frank Miller was at this time in his career. There are so many fascinating ideas at play here, all mashed together in an over-the-top romp that snowballs as it continues, gaining characters and momentum and escalating to an unforgettable titan-clashing climax. 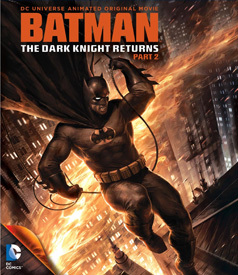 The Dark Knight Returns is completely self contained, so if you’re a first timer with no prior knowledge you will still get a great deal out of it. And if you’re a hardened fan then this is a worthy companion piece to the book. Highly recommended, and I really get a kick out of the fact that this thing even exists. There were a lot of reasons to pick this one up: I'm a big fan of Aubrey Plaza, my wife's a big fan of Mark Duplass, we both like Jake Johnson (who plays Nick on New Girl), and given that it's from the folks that gave us Little Miss Sunshine, why not? The movie is billed as a comedy, but it's not the funniest thing on earth. 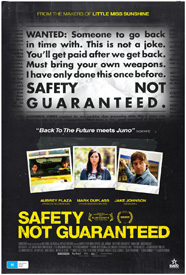 Johnson and Plaza play a magazine reporter and an intern who go do some investigating regarding a classified ad that promises time travel - you may remember it from the internet all those years ago. The "time traveler," played by Duplass, immediately hooks in Plaza and the film follows the two of them getting everything together for their trip. There's also a fairly unnecessary diversion regarding Johnson's high school sweetheart. The movie was good, I suppose. Duplass comes across as a character that probably shouldn't be played for laughs, but is anyway, and the ending threw an impressive curveball my way, I thought. Beyond that, however, I felt like the movie was a bit of a disappointment overall: not as funny as it could have been, not as charming as it wanted to be, and a little more uncomfortable than intended. The story of a squad of professional track athletes competing at the 2011 World Athletics Championships, Fast Girls boasts a cast chock-full of pop culture pedigree. Lenora Crichlow (Being Human), Noel Clarke (Doctor Who), Bradley James (Merlin) and Rupert Graves (Sherlock) feature in this rags-to-riches tale written by Mickeh Smiff (Noel Clarke) himself. Crichlow is exceptionally likeable as our ‘rough around the edges’ heroine Shania, making plenty of mistakes along the way but ultimately emerging victorious (c’mon, it’s a feel-good sports movie, how did you think it was going to end?). She battles not only with her own feelings of worth and belonging, but also against the racing administration, heavily biased against her under the influence of her main rival’s father. When I found out Noel Clarke was the man behind this one, I was understandably a little bit cautious (which is probably unfair; I’ve only seen him in two things, I had no idea what he was like as a writer! ), but he delivers a solid script that is sharp and entertaining despite leaning on a few very safe sporting movie tropes. The soundtrack was really a highlight for me, with different genres used to distinguish between the various settings. British urban played over Shania’s home life scenes, while scenes relating to training or competing had a slightly more electronic feel. The juxtaposition felt very natural, at no point did it feel jarring or out of place. I didn’t expect to get a lot out of this one, and while it’s hardly a groundbreaking movie, I was pleasantly surprised and enjoyed it a lot. It had the same sort of appeal as 2002’s Bend It Like Beckham, so if you liked that one back in the day, be sure to check out Fast Girls. 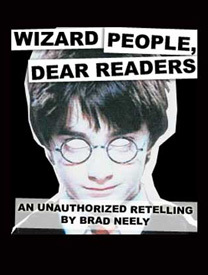 Wizard People, Dear Reader is an alternate soundtrack for the very first Harry Potter film, where Brad Neely takes the childlike, whimsical introduction to the series and turns it into a fast-paced, angsty, slobbering, riot of a film. It never really stops being hilarious, and I hope the Harry Potter superfans can enjoy it as much as I did. The tone is pretty much set from the start. "Out from the shadows of God knows what dimension steps the oldest wizard in the books, the Near-Dead Dumbledore." The name calling only starts there. We eventually meet Professor Hardcastle McCormick, Hagar the Horrible, Master P a/k/a HP, his cousin Ragtime Roast Beefy, Ronnie the Bear, The Wretched Harmony, and Snake. The soundtrack can be downloaded and synched up with the film (here at Archive.org) but if you're lazy just hit up YouTube. All 34 chapters are there. 1-4 and 10 are favorites, but the entire film is amazing. WARNING THOUGH: It's tough to watch the film without the soundtrack now. I'll never get the line "Ron Loves Twizzlers" out of my head when watching it, and I'm perfectly fine with that.